The lack of sleep has many negative effects associated with it. Maintained sleep deprivation results in a degraded performance over time (in this case reaction time). Assuming one needs 8 hours of sleep each night, but during the weekdays he only sleeps 6, is it possible to catch up on those lost hours of sleep during the weekend? There is evidence that 'recovery sleep' is different from ordinary sleep. Carskadon and Dement (2005) measured a sleep pattern that favors Slow Wave Sleep (SWS) after 38 hours without sleep. Personally I also experience it takes me longer to wake up after being sleep deprived, which makes me believe at least your body is trying to make up for something. Reduced time in bed is associated with deficiency of the neuronal process associated with change detection, which may recover after one week of sleep extension, whereas attention-dependent neural processes do not normalize after this period of time in habitually short sleeping individuals and may require longer recovery periods. It gives an indication recovery of some symptoms is possible, but recovery time is not equal for all symptoms. However, the participants in this study seem to be habitual short sleepers. A more recent study (2015) by Brice Faraut concludes "[...] data suggests a 30-minute nap can reverse the hormonal impact of a night of poor sleep, [...]". I am wondering whether it is possible to recover from the lost hours over the week during the weekend entirely. E.g. if you lost 8 hours, by sleeping 8 hours more during the weekend. The notion of sleep dept still seems to be up for debate, but perhaps there is more certainty on short term (1 week) effects? Well, to be able to answer your question affirmatively, we'd have to know all the effects of sleep deprivation, including the long term ones, and those are still are not fully accounted for. Serial 24-h IL-6 plasma levels increased significantly during sleep restriction and returned to baseline after recovery sleep. Serial 24-h cortisol levels during restriction did not change compared with baseline, but after recovery they were significantly lower. Subjective and objective sleepiness increased significantly after restriction and returned to baseline after recovery. In contrast, performance deteriorated significantly after restriction and did not improve after recovery. 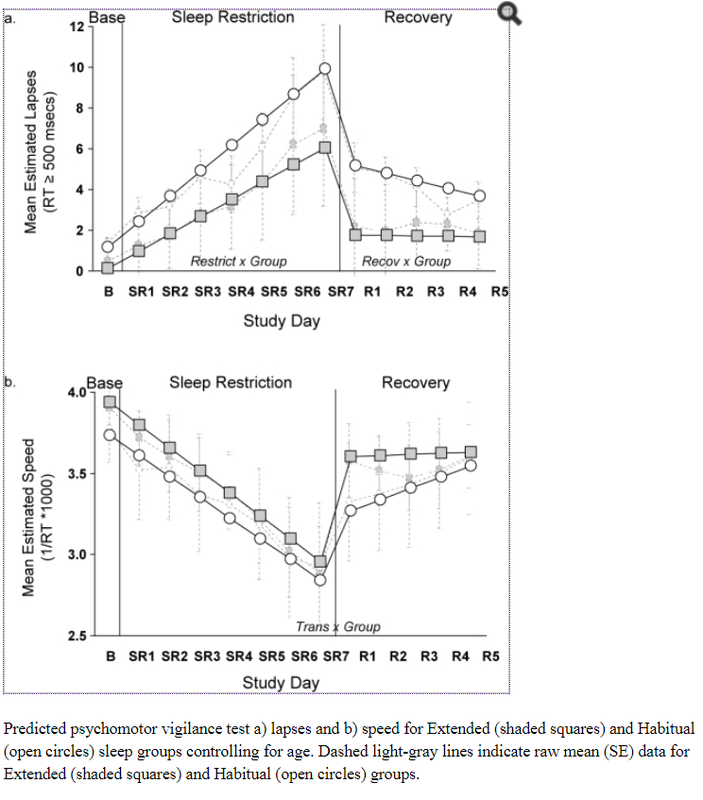 Extended recovery sleep over the weekend reverses the impact of one work week of mild sleep restriction on daytime sleepiness, fatigue, and IL-6 levels, reduces cortisol levels, but does not correct performance deficits. The long-term effects of a repeated sleep restriction/sleep recovery weekly cycle in humans remain unknown. It's indeed a good question how many more nights of leisurely sleep would cause PVT to recover. I strongly doubt the impairment is permanent. Alas the study by Pejovic et al. didn't have any follow-up after the weekend. A 28-h period of the 3/1 chronic sleep restriction (CSR) protocol [sleep reduced to ~60% of normal as result of this protocol -- my note] disrupted performance on a sustained attention task in rats, as sleep deprivation does in humans. Performance improved after longer [one week -- my note] periods of CSR, suggesting allostatic adaptation, contrary to some reports of progressive deterioration in psychomotor vigilance task performance during CSR in humans. However, as observed in humans, there were individual differences among rats in the vulnerability of their attention performance to CSR. 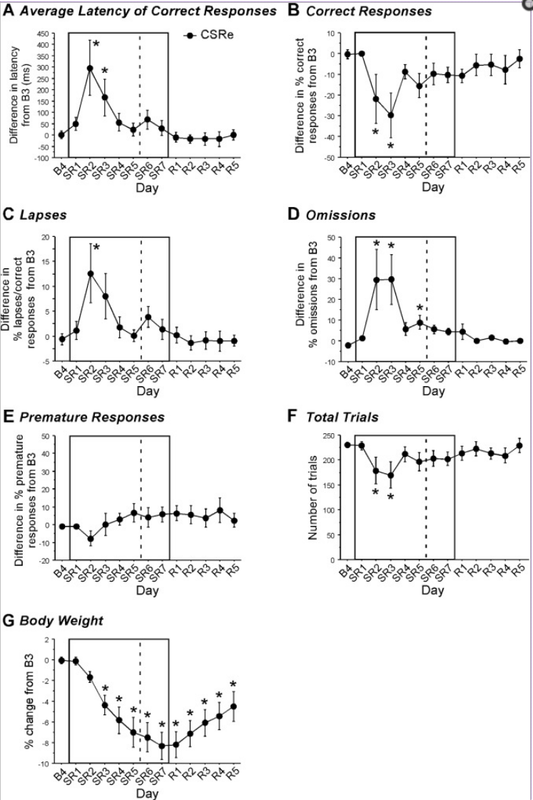 Below are the graphs from the paper on the week-long CSR, which shows the remarkable allostatic adaptation on PVT, but not on weight loss. I've also consulted the 6th edition (2017) of Principles and Practice of Sleep Medicine; its chapter on sleep deprivation (and recovery) has among its authors two of the co-authors (the lead and the PI--Dinges) of the Banks study I already mentioned. So its conclusion are somewhat similar. Few studies have examined recovery sleep after periods of sleep restriction. [...] Although participants felt that their functioning was restored, with subjective reports of sleepiness and performance recovering to baseline, subjective measures do not appear to accurately parallel objective measures of neurobehavioral recovery. These findings suggest that more than 2 or 3 nights of extended sleep may be needed to return neurobehavioral functions to baseline levels. [...] Overall, work to date suggests that complete recovery from a period of sleep restriction may necessitate a sleep opportunity of more than 10 hours or more than 3 days if sleep is restricted to 8 hours a night. In addition, different aspects of performance and neurobehavioral function appear to recover at different rates, with different trajectories. Rupp et al extended the recovery period to five 8-hour sleep opportunities, following a week of sleep restricted to 3 hours of time in bed each night. 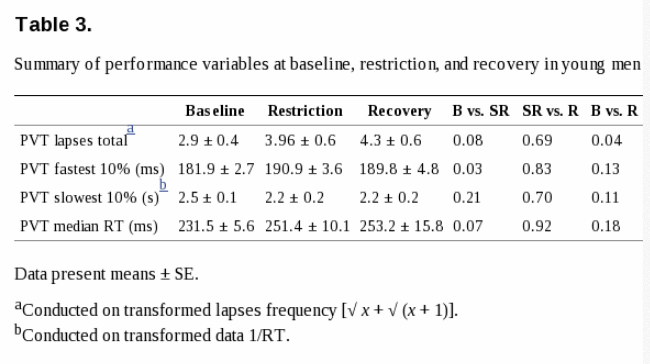 Despite the extra recovery nights, performance still failed to return to baseline levels. In a second group that extended their sleep prophylactically to 10 hours of time in bed before the period of sleep restriction, performance declined at a slower rate and recovered to baseline more quickly, suggesting that sleep restriction and recovery vary as a function of prior sleep. Therefore, sleep extension or supplemental nap sleeps can be used as a prophylactic measure or countermeasure to lessen the performance effects of sleep deprivation during periods of extended wakefulness or sleep deprivation. “Extension” group (nightly TIB = 10 h) or a “Habitual” sleep group (usual nightly TIB). To determine Habitual Sleep schedules for volunteers assigned to the Habitual Group, actigraphic estimated total sleep time on weeknights (Sunday through Thursday nights; nights excluded if followed by a holiday or weekend) was determined, and 15 min were added to the average (to avoid inadvertently sleep restricting volunteers) and rounded up to the nearest 5 min for the final TIB amount. Bedtime was determined by subtracting TIB from the 07:00 rise time (i.e., a subject averaging 7 hours 15 min of sleep would have a bedtime of 23:45). No group differences in subjective sleepiness were evident during any phase of the study. For both PVT variables, younger individuals showed a steeper slope of performance deterioration during sleep restriction and steeper slopes of improvement during the transition from sleep restriction to recovery and during recovery compared to older individuals. Honestly I'm a bit concerned about overfitting because this was a small study (two dozen participants). However they say in their discussion of related research that this observed interaction/influence (of age) is consistent with other studies. Perhaps it goes along with the received wisdom that older people [need to] sleep less. Another paper derived from the same study of Rupp et al. 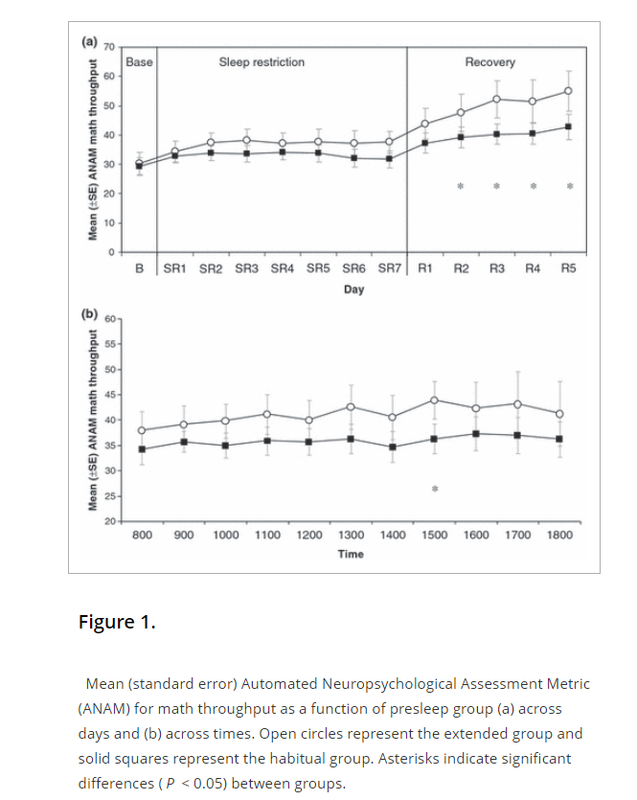 looked at math throughput and task acquisition (tested using ANAM, which presents a significant learning effect) and found that their observations mostly mirror those for PVT, except that presleep wasn't as significant as recovery sleep for this math/learning test. While the increase [in Total Mood Disturbance -- my note] tended to be greater in women, in both groups self-ratings of mood returned to baseline after 1 night of recovery sleep. Reynolds et al., (1986) Sleep deprivation in healthy elderly men and women: effects on mood and on sleep during recovery. Everything up to 1:25 of this clip should answer your question. It looks like the general answer to your question is "No". "[...]says Dr. David F. Dinges, one of the study authors and Chief of the Division of Sleep and Chronobiology at the University of Pennsylvania School of Medicine." Should give your more information on where to find the specific study they performed. Unfortunately, the name of this study was not given.